Dr. Mumun Sinha did her MBBS from LHMC & joined DAMS Foundation + Test & Discussion Course (2 yrs). Dr. Mumun Sinha: Perseverance & hard work. Dr. Mumun Sinha: They helped me keeping a positive attitude. During the time of internship you lose your confidence at each & every step of support system is definitely required. Dr. Mumun Sinha: Yes, even after giving the exam. Dr. Mumun Sinha: I read subject wise books & for the last 2 months previous 5 yr question from AA & MK. Dr. Mumun Sinha: Most productive Ruchi Rai, Sumer Sethi, AA & MK, Gobind Garg, Rachna Chaurasia, Least Productive Across. Dr. Mumun Sinha: Very imp especially notes during classes were my mainstay during last 10 days. Dr. Mumun Sinha: Extensive Study. 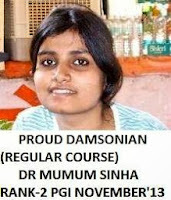 Dr. Mumun Sinha: Multiple PG exams help in practising especially if your target is all India PG. You gain confidence with each & every one. Dr. Mumun Sinha: Opthal, Ortho, Dermat, Anaesthesia & Medicine. Dr. Mumun Sinha: I attempted 190 questions & more some about 180 of them. Dr. Mumun Sinha: Radiodiagnosis from AIIMS, I am preparing for may AIIMS 2013. Dr. Mumun Sinha: Dr. Sumer Sethi, Opthal mam, Surgery sir, Dermat sir, Paeds sir.